After my recent post on pushing through failure, I received some really positive feedback from the higher ed community to continue pushing through—and thanks a ton for that! I also received a few messages and emails asking what it is that makes me want to push through. Where did the motivation come from? How do you pull yourself out of a failed attempt? To clarify, my startup itself didn’t fail. Has it taken off fully? Nope. But the failure I discussed was a huge setback in my race to launch. So to answer your question regarding what pulled me through my failure directly, Anthony, Jen, Christina, Jordan, and the random email I got that I tried responding directly to but couldn’t for some reason (whoever you are)—my startup is simply a step toward a larger end goal. Looking at it as a step in my career path rather than a career in itself allowed--allows--me to focus on the big picture. Of course, it took me a few months to actually realize this. What’s my big picture? First impressions. That’s pretty vague, but that’s it. In a not-so-humble-brag-kind-of-way (mostly because humble brags are actually more of a brag than a regular brag), relationships are my thing. Some people are good at accounting. Some are good at sports. Some can build the hell out of a house. I understand people. Really well. I’m also like a human CRM. I can have one conversation with a person and tell you a year later exactly what we talked about and connect them to a totally unrelated person based on a random commonality. In the end, all relationships start (obviously) with the first impression and the ability to manage that. For many students, the college fair is that initial person-to-person impression that a prospective student has with an institution. leadpath works to improve a small piece of the puzzle. It’s a step. Other first impressions are ads, campus visits, or a simple phone call with a current student doing an admissions phone-a-thon. My big picture is to consult with institutions to improve first impressions—to make this process easier with technology and training. Each strategy is unique and each institution requires a different approach. The challenges are incredible and something that I look forward to. The business competition was a failure, for sure. But it was only a failure in the sense that we didn’t walk away with $50K. We did walk away with really refined pitches. We walked away with over 70 conversations with institutions spanning the education spectrum. We walked away with input from a couple hundred individuals who took the time to help guide the build out. We walked away with a ton of knowledge. And for my big picture, those things are worth significantly more than the initial $50K. If you get discouraged with a paper, a project, a business venture, or some other personal challenge, it’s easier channel your disappointment into motivation when looking at the bigger picture, the end goal. 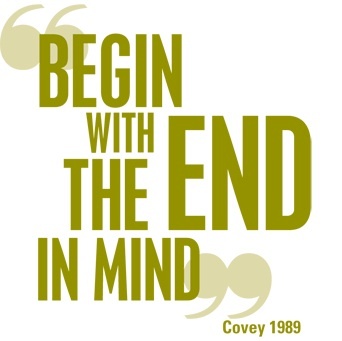 Also, I'm a big Stephen Covey fan. His book on The 7 Effective Habits of Highly Effective People was written two years after I was born and I have read it a number of times. It's every bit as true as the day it was published.